When developing Windows Presentation Foundation (WPF) standalone and browser-hosted applications, you must consider the security model. WPF standalone applications execute with unrestricted permissions ( CASFullTrust permission set), whether deployed using Windows Installer (.msi), XCopy, or ClickOnce. Deploying partial-trust, standalone WPF applications with ClickOnce is unsupported. However, a full-trust host application can create a partial-trust AppDomain using the .NET Framework Add-in model. For more information, see WPF Add-Ins Overview. WPF browser-hosted applications are hosted by Windows Internet Explorer or Firefox, and can be either XAML browser applications (XBAPs) or loose Extensible Application Markup Language (XAML) documents For more information, see WPF XAML Browser Applications Overview. WPF browser-hosted applications execute within a partial trust security sandbox, by default, which is limited to the default CASInternet zone permission set. This effectively isolates WPF browser-hosted applications from the client computer in the same way that you would expect typical Web applications to be isolated. An XBAP can elevate privileges, up to Full Trust, depending on the security zone of the deployment URL and the client's security configuration. For more information, see WPF Partial Trust Security. This topic discusses the security model for Windows Presentation Foundation (WPF) standalone and browser-hosted applications. For XBAPs, WPF distinguishes two types of navigation: application and browser. 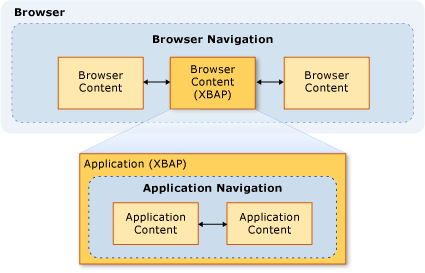 The type of content that is considered safe for an XBAP to navigate to is primarily determined by whether application navigation or browser navigation is used. Application code XAML resources that have a compiled code-behind. For more information about application data files and pack URIs, see WPF Application Resource, Content, and Data Files. User Navigation. The user navigates by clicking a Hyperlink element. Programmatic Navigation. The application navigates without involving the user, for example, by setting the NavigationWindow.Source property. User Navigation. The user navigates by clicking a Hyperlink element that is within the main NavigationWindow, not in a nested Frame. Zone. The content being navigated to is located on the Internet or the local intranet. Protocol. The protocol being used is either http, https, file, or mailto. If an XBAP attempts to navigate to content in a manner that does not comply with these conditions, a SecurityException is thrown. The security settings on your computer determine the access that any Web browsing software is granted. Web browsing software includes any application or component that uses the WinINet or UrlMon APIs, including Internet Explorer and PresentationHost.exe. Click Network and Internet and then click Internet Options. The Internet Options dialog box appears. On the Security tab, select the zone to configure the security settings for. The Security Settings dialog box appears and you can configure the security settings for the selected zone. You can also get to the Internet Options dialog box from Internet Explorer. Click Tools and then click Internet Options. Loose XAML. 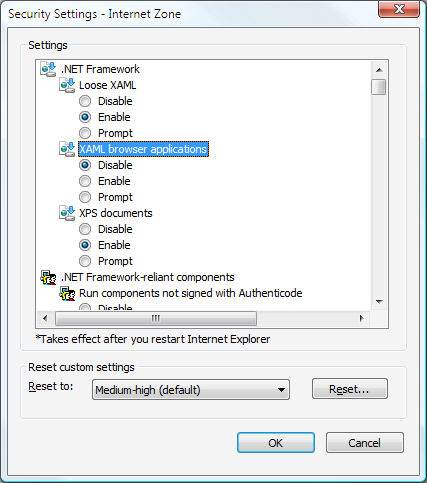 Controls whether Internet Explorer can navigate to and loose XAML files. (Enable, Disable, and Prompt options). XAML browser applications. Controls whether Internet Explorer can navigate to and run XBAPs. (Enable, Disable, and Prompt options). By default, these settings are all enabled for the Internet, Local intranet, and Trusted sites zones, and disabled for the Restricted sites zone. The following table lists the values that can be set. XBAPDisallow REG_DWORD 1 to disallow; 0 to allow. LooseXamlDisallow REG_DWORD 1 to disallow; 0 to allow. WebBrowserDisallow REG_DWORD 1 to disallow; 0 to allow. MediaAudioDisallow REG_DWORD 1 to disallow; 0 to allow. MediaImageDisallow REG_DWORD 1 to disallow; 0 to allow. MediaVideoDisallow REG_DWORD 1 to disallow; 0 to allow. ScriptInteropDisallow REG_DWORD 1 to disallow; 0 to allow. The WPF WebBrowser control can be used to host Web content. The WPF WebBrowser control wraps the underlying WebBrowser ActiveX control. WPF provides some support for securing your application when you use the WPF WebBrowser control to host untrusted Web content. However, some security features must be applied directly by the applications using the WebBrowser control. For more information about the WebBrowser ActiveX control, see WebBrowser Control Overviews and Tutorials. This section also applies to the Frame control since it uses the WebBrowser to navigate to HTML content. If the WPF WebBrowser control is used to host untrusted Web content, your application should use a partial-trust AppDomain to help insulate your application code from potentially malicious HTML script code. This is especially true if your application is interacting with the hosted script by using the InvokeScript method and the ObjectForScripting property. For more information, see WPF Add-Ins Overview. If your application uses the WPF WebBrowser control, another way to increase security and mitigate attacks is to enable Internet Explorer feature controls. Feature controls are additions to Internet Explorer that allow administrators and developers to configure features of Internet Explorer and applications that host the WebBrowser ActiveX control, which the WPF WebBrowser control wraps. Feature controls can be configured by using the CoInternetSetFeatureEnabled function or by changing values in the registry. For more information about feature controls, see Introduction to Feature Controls and Internet Feature Controls. If you are developing a standalone WPF application that uses the WPF WebBrowser control, WPF automatically enables the following feature controls for your application. Since these feature controls are enabled unconditionally, a full-trust application might be impaired by them. In this case, if there is no security risk for the specific application and the content it is hosting, the corresponding feature control can be disabled. Feature controls are applied by the process instantiating the WebBrowser ActiveX object. Therefore, if you are creating a stand-alone application that can navigate to untrusted content, you should seriously consider enabling additional feature controls. This recommendation is based on general recommendations for MSHTML and SHDOCVW host security. For more information, see The MSHTML Host Security FAQ: Part I of II and The MSHTML Host Security FAQ: Part II of II. For your executable, consider enabling the following feature controls by setting the registry value to 1. For your executable, consider disabling the following feature control by setting the registry value to 0. If you run a partial-trust XAML browser application (XBAP) that includes a WPF WebBrowser control in Windows Internet Explorer, WPF hosts the WebBrowser ActiveX control in the address space of the Internet Explorer process. Since the WebBrowser ActiveX control is hosted in the Internet Explorer process, all of the feature controls for Internet Explorer are also enabled for the WebBrowser ActiveX control. XBAPs running in Internet Explorer also get an additional level of security compared to normal standalone applications. This additional security is because Internet Explorer, and therefore the WebBrowser ActiveX control, runs in protected mode by default on Windows Vista and Windows 7. For more information about protected mode, see Understanding and Working in Protected Mode Internet Explorer. If you try to run an XBAP that includes a WPF WebBrowser control in Firefox, while in the Internet zone, a SecurityException will be thrown. This is due to WPF security policy. When managed assemblies are installed into the global assembly cache (GAC), they become fully trusted because the user must provide explicit permission to install them. Because they are fully trusted, only fully trusted managed client applications can use them. To allow partially trusted applications to use them, they must be marked with the AllowPartiallyTrustedCallersAttribute (APTCA). Only assemblies that have been tested to be safe for execution in partial trust should be marked with this attribute. However, it is possible for an APTCA assembly to exhibit a security flaw after being installed into the GAC. Once a security flaw is discovered, assembly publishers can produce a security update to fix the problem on existing installations, and to protect against installations that may occur after the problem is discovered. One option for the update is to uninstall the assembly, although that may break other fully trusted client applications that use the assembly. WPF provides a mechanism by which an APTCA assembly can be disabled for partially trusted XBAPs without uninstalling the APTCA assembly. Value Data: 1 to disable; 0 to enable. If an assembly has to be disabled for partially trusted client applications, you can write an update that creates the registry key and value. Core .NET Framework assemblies are not affected by disabling them in this way because they are required for managed applications to run. Support for disabling APTCA assemblies is primarily targeted to third-party applications. Loose XAML files are markup-only XAML files that do not depend on any code-behind, event handler, or application-specific assembly. When loose XAML files are navigated to directly from the browser, they are loaded in a security sandbox based on the default Internet zone permission set. However, the security behavior is different when loose XAML files are navigated to from either a NavigationWindow or Frame in a standalone application. With this setting, external content will be loaded into a process that is separate from the process that is hosting the application. This process is restricted to the default Internet zone permission set, effectively isolating it from the hosting application and the client computer. Even though navigation to loose XAML files from either a NavigationWindow or Frame in a standalone application is implemented based on the WPF browser hosting infrastructure, involving the PresentationHost process, the security level is slightly less than when the content is loaded directly in Internet Explorer on Windows Vista and Windows 7 (which would still be through PresentationHost). This is because a standalone WPF application using a Web browser does not provide the additional Protected Mode security feature of Internet Explorer.